The obvious choice for H in my A-Z of Japan would of course be haiku (俳句). However, B was for Basho, so I’ve already covered that. Another popular choice would be Hello Kitty, but she gets so much coverage. I also considered hanami (花見 / cherry blossom viewing), but it’s something I’ve talked about a lot before. So, I decided in the end that H is for… Hachiko! Hachiko (ハチ公) is probably the most famous dog in Japan, and he is immortalised as a statue just outside Shibuya Station in Tokyo. It’s a popular meeting place and, as you can see above, many people go there to take a picture with the statue. Well, Hachiko’s story is a well-known one, and it has even been made into a Hollywood film starring Richard Gere (Hachi: A Dog’s Tale/Hachiko: A Dog’s Story). 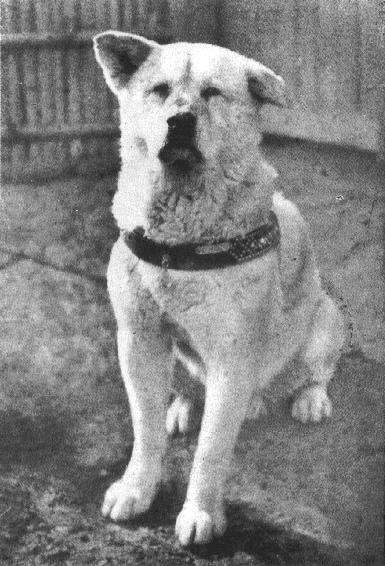 Hachiko was an Akita dog who lived in Tokyo from 1923 to 1935. He became known as “the faithful dog”, because every day he would meet his master at Shibuya Station when he returned from work. Hachiko’s master was Professor Hidesaburō Ueno (上野 英三郎) of the University of Tokyo. One day, Professor Ueno suffered a cerebral hemorrhage while he was at work and never returned to Shibuya Station. Hachiko continued to wait there for his master for the next nine years, until his own death. 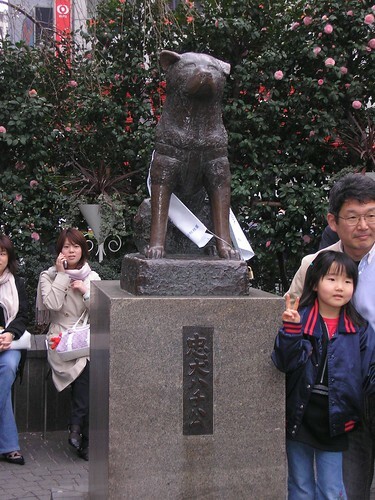 During the nine-year period, Hachiko was noticed by the other commuters and soon became a popular character at the station. They would bring him food and treats, and Hachiko continued to appear every day at the exact time his master’s train was due to arrive. Now, Hachiko’s faithfulness and loyalty is a symbol of Japanese people’s own loyalty. He will always be remembered, and people will always flock to visit him outside Shibuya Station. According to Wikipedia, there is an annual ceremony on April 8th in Shibuya, and many dog-lovers attend. I wonder if this ceremony is still held, and if any of you readers have ever attended? It’s a grand story – but such a sad one. I think we all desire that sort of feeling of attachment – but how often do we find it today? The Hachiko statue is one of the most visited places in Shibuya (outside the main crossing intersection)… of course, it’s also a very convenient meeting spot (I’ll see you at Hachiko). Thanks for stopping by! Yeah, I’ve lost count of the number of times I’ve found myself stood by that dog.